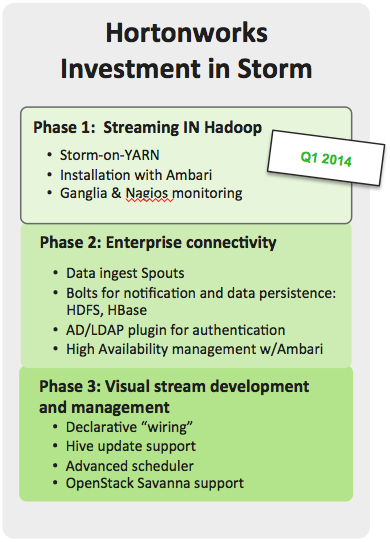 Hortonworks has heard the pleas from its customers, and it’s beginning to integrate the Storm stream-processing engine with the company’s Hadoop distribution. This is a pretty big deal considering Hadoop’s legacy as a relatively slow platform designed for batch processing, but Storm support is just another brick in the wall between Hadoop and its past. Storm is a stream-processing engine created by a company called Backtype several years ago, largely with the goal of supplementing Hadoop with something that could handle real-time processing of streaming data — stuff like sensor data, clicks and status updates. Twitter bought Backtype in 2011 and has been leading Storm development since. However, the open source project has proven mighty popular among the web set, which has already found some innovative ways of running Storm in conjunction with, or on top of, Hadoop. But Hortonworks customers had seen what Storm was capable of at places like Twitter and Yahoo(, Hortonworks VP of Marketing Dave McJannet told me on Monday, and they wanted to turn it on their streaming data, too. They want to do things like advanced geofencing, real-time analysis of web activity or perhaps analyze data from medical sensors as it’s generated. However, as much as Storm is a near polar opposite of Hadoop MapReduce in terms of when and how it processes data, it’s just the latest processing framework that Hadoop can technically support thanks to a new cluster-management layer called YARN. Hortonworks is working to speed up Hive via a new processing framework called Tez. YARN also lets Hadoop users run the in-memory Spark processing framework, and Microsoft is using YARN to make Hadoop more suitable for machine learning workloads. Additionally, YARN lets all these different technologies — as well as HBase, Giraph or anything else — run on the same cluster of physical machines. Mesos, another cluster-management technology (developed at the University of California, Berkeley, and now an Apache project), accomplishes a similar goal, although it’s not tied to the Hadoop Distributed File System like YARN is. All of this activity taken together is much more than the sum of its parts. It’s a pretty clear sign that big data isn’t just a flash in the pan, and that Hadoop will very likely be the dominant platform for running big data applications — whatever shape they happen to take. Feature image courtesy of Shutterstock user Pictureguy.